A detailed, 3,800-word review of the books rewritten under directions of the BJP rulers across India since Prime Minister Narendra Modi came to power in May 2014 has suggested that one of aims of the books is to instill a sense of doubt about India’s democratic polity among the country’s young minds. Reviewed in the prestigious US journal, “The New York Review of Books”, in its latest issue (December 6, 2018) by Alex Traub, the scrutiny insists, the effort has also been to paint Indian history from the angle of “Hindu triumphalism”, even as creating “Islamophobia”. 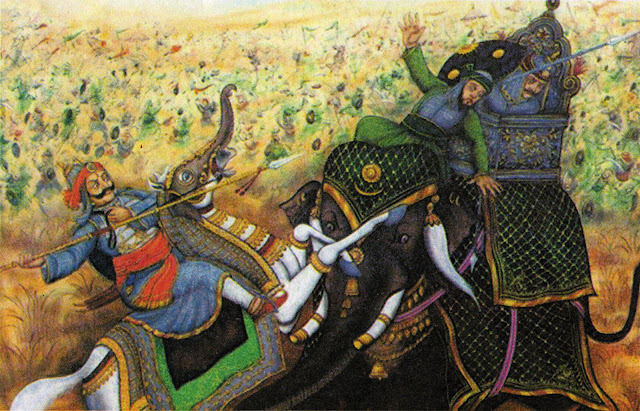 From the sixteenth to the eighteenth century, the Mughal Empire did much to create modern-day India. It consolidated the country into a sovereign political unit, established a secular tradition in law and administration, and built monuments such as the Taj Mahal. The Mughals were originally from Uzbekistan, but over time they became a symbol of the contribution of Muslims to Indian national history. Khan was teaching at the English-medium Saifee Senior Secondary School, whose students are Dawoodi Bohras, a small Islamic sect that has been based in India since the Mughal era, when its leaders faced persecution in the Middle East. Like Jews, Parsis, and Baha’is, the Bohras are a religious minority that found shelter in India’s unusually tolerant culture. Since last year, students at the Saifee School have been using new textbooks published by the Rajasthan government, which is run by the Hindu nationalist Bharatiya Janata Party (BJP) that dominates India’s parliament and state legislatures. The new textbooks promote the BJP’s political program and ideology. These textbooks are part of the BJP’s ongoing campaign to change how Indian history is taught in middle and high schools. Textbooks issued last year by two other states under BJP rule, Gujarat and Maharashtra, resemble the Rajasthan books in their Hindu triumphalism and Islamophobia. The fact that these textbooks are essentially political manifestos is made clear by the way they discuss the ruling party. Rajasthan’s seventh-grade book directs students to “prepare a chart of the advertisements published by the Government about its different schemes and with the help of your teacher discuss the benefits of these schemes.” Swachh Bharat (Clean India), a government initiative to improve India’s hygiene with which Modi has closely aligned himself, is mentioned in five of the updated federal textbooks. India is infallible; its citizens, however, must be disciplined. Gujarat’s eighth-grade book insists that “awareness regarding co-operating with the security agencies has to be developed.” Social harmony should be pursued even at the expense of individual rights: Rajasthan’s seventh-grade book recommends, “We should refrain from negative acts like strikes.” There is a whiff of authoritarianism in these proposed limits on autonomy and dissent. Rajasthan’s official ninth- and tenth-grade social science books appear not to be available in English, but a private company has published its own editions that follow the same syllabus as the new textbooks. These books were being used by the Saifee School, and they were the only editions I could find in the bookstores of Udaipur, the city where the school is located. The tenth-grade book is more explicit in listing the “demerits of democracy,” including that “democracy teaches a person to be selfish, cunning and illusive,” that democracies do not produce economic development, and that they are weak in times of crisis. This is not the first Gujarat textbook to praise fascism: the last one was the ninth-grade social science book of the mid-2000s, when Modi ran the state government. The offending section was not removed until after a visit from the consul general of Israel. The episode became international news and is still frequently referred to, yet the treatment of Nazism in the new textbook seems to have gone unreported. It is not an accident or eccentricity that the Gujarat books keep exalting Hitler. A positive view of fascism enables a government eager for more power to tell its citizens about the potential of “strict measures” to “transform” society. It provides a model for Hindutva’s emphasis on “honour” as a reward for the “strong.” More importantly, it gives historical precedent to Hindutva’s wish for a homogenous citizenry. The main project of Hindu nationalist history is justifying the claim that Hindutva groups deserve a special status as India’s “one united whole.” Its central premises are that Hindus are India’s indigenous group; that the rule of Hindutva communities was glorious; that the rule of non-Hindutva communities was disastrous; and that Hindu nationalists have been responsible for winning back India’s freedom. Regardless of whether these propositions have anything like the moral implications Hindu nationalists hope for, each of them is factually dubious. The word “Hindu” is not indigenous to India. It comes from an Old Persian word used by Arabs and Turks to refer to the people who lived around the Indus River. The religious sense of the word “Hindu” does not seem to have existed until the second millennium AD. Ruins associated with the Harappan civilization suggest that an urban society without any obvious connection to the pastoral world described by the Vedas existed in India as early as the third millennium BC. Not only do the Vedas seem far removed from India’s earliest-known civilization, but they were also probably composed by the descendants of recent migrants to India who dominated other longer-standing groups in the form of the caste system. In their discussions of the Mughal era, the Nehruvian textbooks emphasized Akbar, who empowered Hindu generals, married Hindu princesses, participated in Hindu ceremonies, abolished religious taxes, and held spiritual discussions with Hindus, Christians, Jews, and even atheists. These details are neglected in the new Rajasthan and Gujarat books, which concentrate instead on Aurangzeb (1618-1707), the emperor who reinstated religious taxes and destroyed some Hindu temples. The truth is more complicated: as Audrey Truschke, an assistant professor of history at Rutgers University, writes in her recent book, Aurangzeb: The Life and Legacy of India’s Most Controversial King, Aurangzeb “employed more Hindus in his administration than any prior Mughal ruler by a substantial margin” and supported Hindu religious practices in numerous ways. The Rajasthan books use the more pungent phrase “foreign invaders” for the Mughals, but there is little evidence that most Indians saw them that way. In fact, during the armed struggle against the British in 1857, Hindu and Muslim rebel soldiers from all over India came to Delhi and proclaimed Bahadur Shah Zafar, the inheritor of the much-weakened Mughal Empire, the leader of their movement and the symbol of home rule. The same tactics of selection and elision characterize the textbooks’ portrayal of the freedom movement. Mohandas Gandhi and Nehru are generally considered the most consequential figures of this period. Both, however, embody the “ancient palimpsest” view of Indian history that Hindutva seeks to eradicate. The Gujarat and Rajasthan textbooks emphasize instead figures of notable “manliness,” such as Bhagat Singh, whose activities during the independence movement included killing a British policeman and bombing the Central Legislative Assembly of the British Empire. “The revolutionary martyrs wrote the history of Indian independence through their blood,” according to Rajasthan’s tenth-grade book — a rather far cry from Gandhian nonviolence.